Hi again Munchkin Blog readers! It’s @lunchesandlttles here, excited to be back again to share another yummy recipe with you! We just finished up the final few days of school, and summer break is here! If you have school-aged children yourself, you know what I am talking about, as you are probably really close to break time or just starting yours too (and as an aside- didn’t this school year just fly by? I think I am still a bit in denial that everything just wrapped up). Anyways, summer brings about all kinds of changes. For our family, like many others, summertime means more time enjoying the outdoors, more activity packed into our daily schedules, later bedtimes, and yes – less time in the kitchen for me. Of course, any recipe that allows me less time cooking, and more time with our kids is a winner. But this one has the bonus of being a one pot dish as well. And that combo of not only coming together fast, but also coming together in one pan has #momwin written all over it. Now, I know that some parents may look at this dish and be intimidated, skeptical, etc. Thinking, “Will my kid(s) really eat that? Yes, this dish does have many visible vegetables, but the way they all get cooked together in the sauce really helps their flavors blend and the purposeful use of lots of colors (an assortment of pepper colors, instead of just green peppers – for example) also really helps with the appeal from a kid perspective. If you follow me over on my feed, @lunchesandlittles, you have probably heard me say a thing or two about colorful food. I am a firm believer that we all eat with our eyes first, and so creating dishes in my home that are colorful, fun and healthy are really important to me. 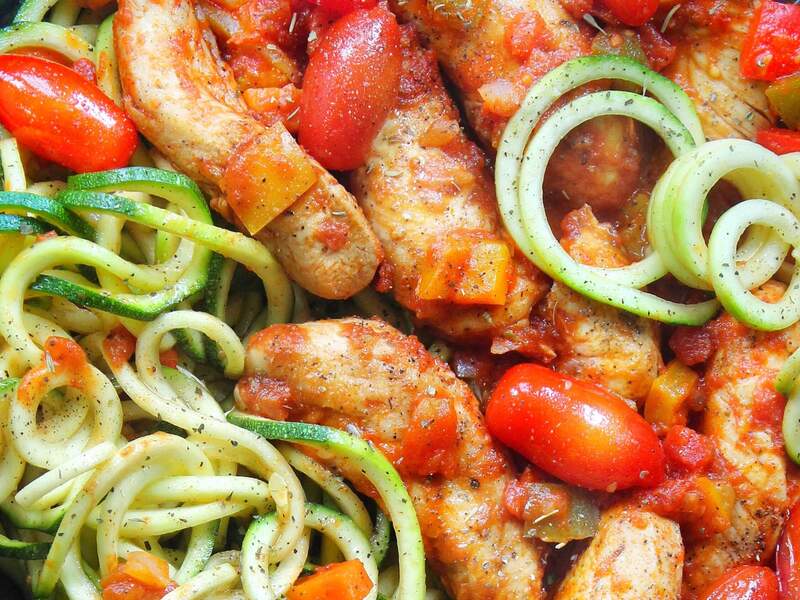 This One Pan Chicken Cacciatore w/ Spiralized Zoodles is very colorful and the spiralized zucchini makes it extra appealing, doesn’t it? 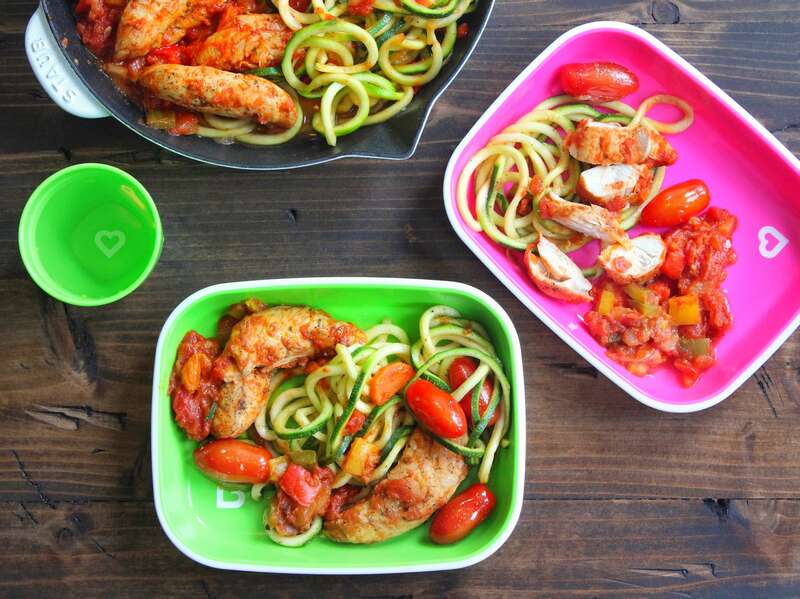 If you do not own a spiralizer, you can of course still make this dish using zucchini slices instead; I just have a love for all things spiralized (and totally recommend spiralizing some vegetables yourself! 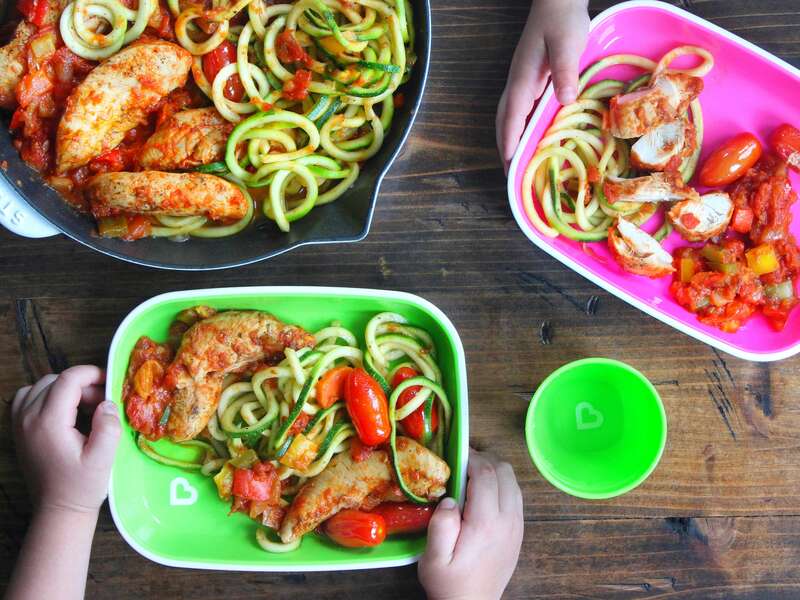 Our kids will eat several different things spiralized, that they would not otherwise eat). Check out the full recipe below and if you happen to make this delicious dish – we want to see! Be sure to tag #munchkininc and #lunchesandlittles in your posts! *And, as always, before starting, be sure to read through the entire recipe below, to ensure best results! 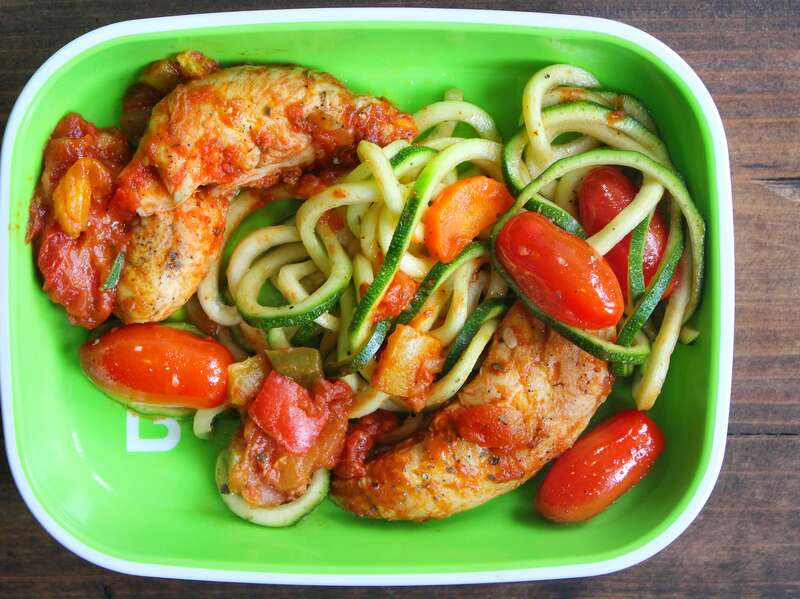 *If you do not plan on spiralizing your zucchini for this recipe, use less zucchini here. 1 or 2 zucchinis sliced would suffice. Start off by prepping your produce: spiralize your zucchini, if desired, using a thin noodle blade, per manufacturer’s instructions. Cut bell peppers into small bite-sized pieces, dice onion and slice carrot pieces, then cut again in half. Set all produce aside. Season chicken generously with salt, pepper and Italian herbs on both sides. Set aside. Heat olive oil in a large skillet or pan over medium-high heat. 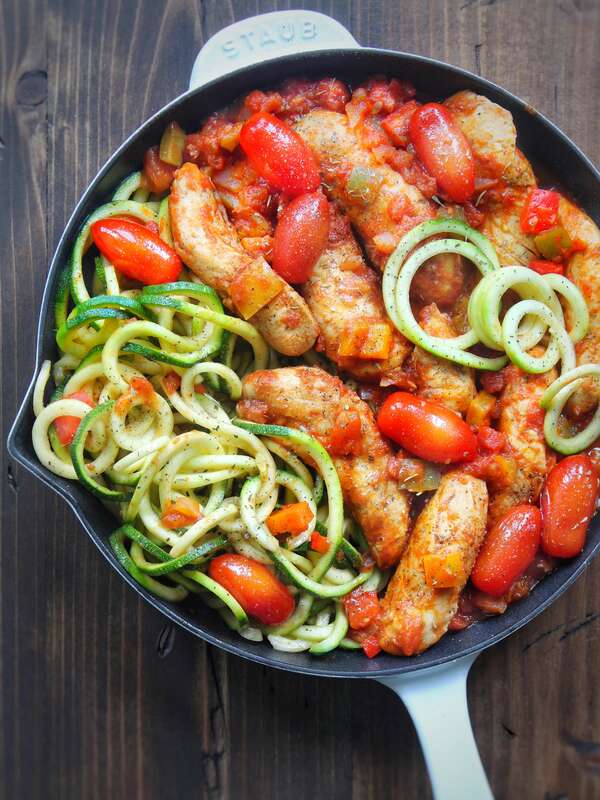 Once pan is hot, add zucchini noodles and sauté for a couple minutes continually tossing as you cook. Once zoodles are cooked to your liking, remove from pan and set aside. Next, add seasoned chicken to pan and cook for a couple minutes on each side, until lightly browned. Once chicken is browned, remove from pan and set aside. In same pan, still over medium heat, add in your bell peppers, carrots and onion. Cook for a couple minutes. Season veggies with salt, pepper and Italian herbs. Then, add chicken stock, diced tomatoes and tomato sauce to the pan with vegetables and bring to a boil. Allow to boil 1- 2 minutes, then reduce to a simmer. Add chicken back to pan and simmer everything together for approximately 20 minutes. In the last 5 minutes or so of cooking, add tomatoes to pan and incorporate into dish/allow to cook and blister slightly. Once chicken is cooked through, veggies are tender and sauce has thickened, remove pan from heat. Allow to sit for 1- 2 minutes before serving (sauce will still thicken a bit). Just before serving, add additional fresh tomatoes, if desired, and season once more as desired. This recipe is a great one to give a try with your family – even with little ones! You may be surprised at how much they like it. The flavors are so delicious and you can always modify the recipe to fit your family best. For example, if you’re kids are not huge fans of peppers – don’t use as many or omit all together. Love garlic? – Try adding some of that in. For more quick and easy kid-friendly recipes be sure to check out my feed, @lunchesandlittles where I am making meals and snacks like this all of the time. 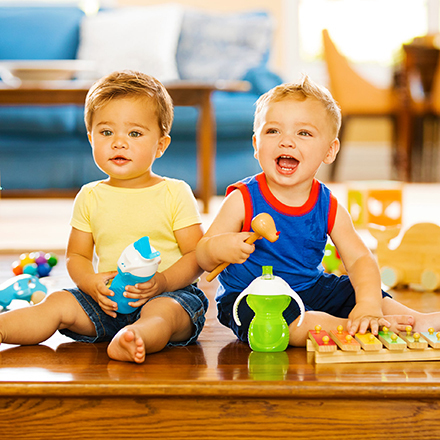 And check out www.munchkin.com for feeding supplies and more for your little ones, like the cups and plates from their new Splash Collection shown here. 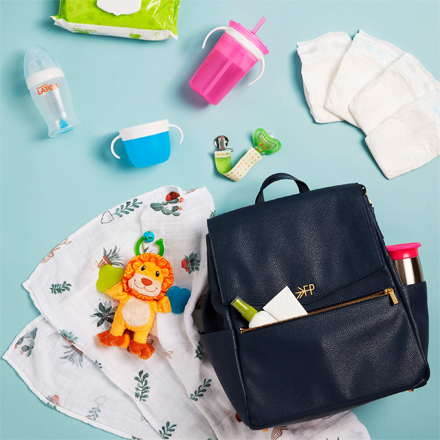 Lunches + Littles focuses on quick, healthy and fun meal options for little ones while sharing practical tips & tricks on how to make meals enjoyable, all the while keeping things simple. 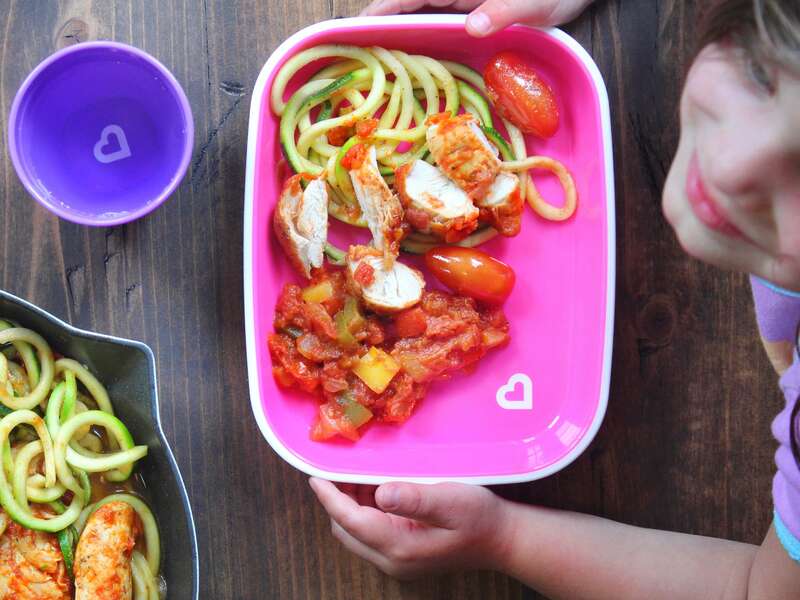 A lover of colorful plates and an advocate for getting kids in the kitchen, Lunches + Littles is also a great resource for parents of picky eaters, parents looking for healthy family and toddler recipes and those mamas (dads too!) who are short on time. A mantra of sorts - making meals fun doesn’t have to be hard! With 3 little ones (4 and under) it can’t be! Follow @lunchesandlittles for more!